Donald Trump says MSNBC and the co-host of "Morning Joe," Mika Brzezinski, should "immediately" apologize to one of his prominent supporters, Pastor Mark Burns. The GOP nominee says Friday's interview of Burns was a "coordinated gang attack." In a statement on Sunday, Trump calls it "one of the most appalling things I have ever seen on television." On Monday's show, Brzezinski made no mention of the controversy. Friday's segment was contentious, to say the least. The website Mediaite described the segment this way: "Brzezinski Browbeats Black Pro-Trump Pastor: Is It Racist, Yes or No?" Burns made the TV news rounds last week supporting Trump's candidacy. In his "Morning Joe" appearance on Friday, Brzezinski asked Burns, when Trump "made the comments he made about the judge saying he was a Mexican, was that racist, or not?" When he didn't immediately answer the question, Brzezinski interrupted: "I just want to know if it's racist or not, and then I can move on with the conversation, but I need to know where you stand on things in terms of reality. So were those comments racist or not?" Later in the segment, one of the show's contributors, Mike Barnicle, asked Burns if he agreed with Trump's labeling of Clinton as a "bigot." Brzezinski, Barnicle and Rev. Al Sharpton all pressed for an answer. Burns said answering the question "doesn't solve" the problem of how to create more jobs for African-Americans. "So why are we here on national television, wasting this wonderful time when we should be discussing" black unemployment, he said. Brzezinski's co-host, Joe Scarborough, was off on Friday morning. That's why Trump's statement on Sunday focused on Brzezinski, whom he called "untalented." "Liberals like Mika Brzezinski and MSNBC believe they are morally superior and will try to beat down those who are different," Trump said. "They only did this because Pastor Burns does not blindly follow what liberals want him to think or say. Pastor Burns deserves a public apology from Mika and MSNBC immediately." 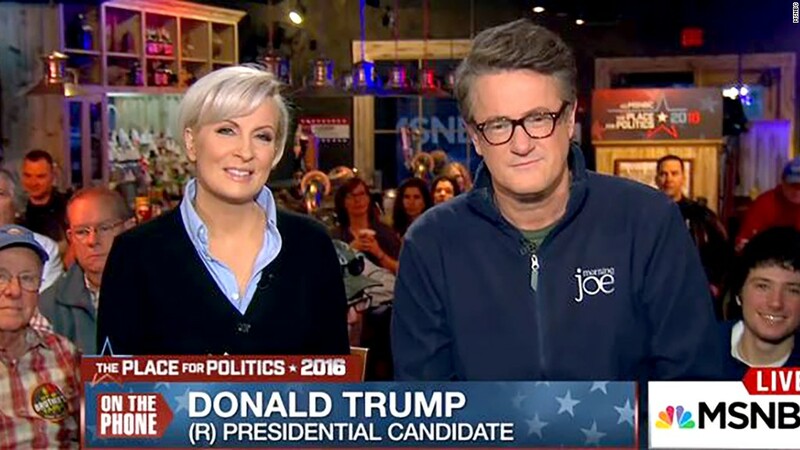 Trump also called MSNBC and "Morning Joe" in particular "the propaganda arm of Hillary Clinton and her campaign." The statement is notable because Trump previously had a very friendly relationship with "Morning Joe," calling into the show regularly during the primary season. The relationship turned very tense in February, however, and has stayed that way almost ever since. Earlier this week, Trump repeatedly attacked Brzezinski and Scarborough in highly personal ways on Twitter. Trump also tweeted his dissatisfaction about the Burns interview after the show. "Wonderful @pastormarkburns was attacked viciously and unfairly on @MSNBC by crazy @morningmika on low ratings @Morning_Joe. Apologize!" he wrote on Friday. Wonderful @pastormarkburns was attacked viciously and unfairly on @MSNBC by crazy @morningmika on low ratings @Morning_Joe. Apologize! In Sunday's statement, though, he seemed to call the show highly-rated, saying the "disgusting" episode unfolded in front of "millions of viewers."